In February of 2014, after much prayer and conversation with our Haitian prayer warriors, a decision was made to purchase land to pursue a dream that God had placed on the hearts of a few to build a medical clinic and eye center outside of Cap Haitien, Haiti. God continued to lead by opening doors and providing in every way needed to begin construction of a wall followed by completion of a storage building/apartment, guesthouse, medical clinic and eye center. Just over 3 years after purchasing the property, all buildings were completed and the grand opening of the Cathy Pearson Memorial Medical Clinic and Fortune Previl Memorial Eye Center occurred in May of 2017. The clinics continue to operate daily Monday through Friday by the dedicated work and commitment of our Haitian staff including physicians, nurses, lab tech and all support and leadership staff. Julmice Louis, the director of operations, oversees all of the work and coordinates with everyone on the staff to support the work that each has been called to perform. We know that God has brought each of these Spirit-filled, servant-minded leaders to our staff for the purposes that He had designed long ago. 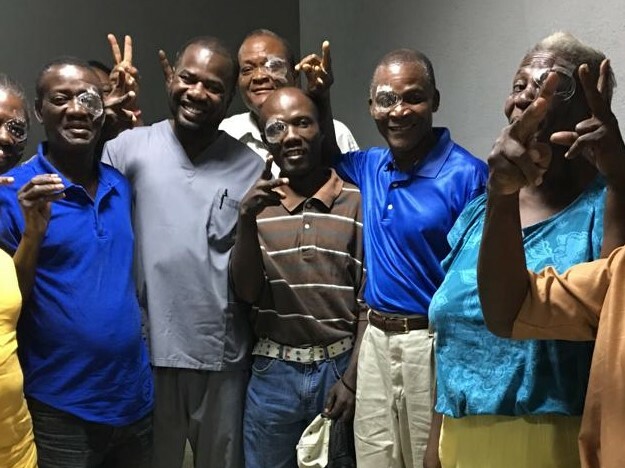 We have just completed hosting our second eye surgery team where nearly 50 individuals were able to receive cataract surgery and with that the gift of sight. This opportunity that God provided is one that had been dreamed about early on when the property was first purchased and prayers were offered for God to lead us where He would have us to go. Please continue to pray with us as we follow His lead. We are praying for more and more opportunities to influence our neighbors in this community for Christ. We are praying for Him to bring us individuals to serve as Community Development leaders so that we might be able to develop more and more relationships with people for Christ. We are praying for ways to serve the community through education scholarships. We are praying that He will show us ways to reach out that we have not yet considered. We are confident that He will continue to be faithful as He has provided more than we could ask or imagine. Consider joining with us financially and watch and see what He will do next! Waiting on God, Fearless to Move, Trusting His Provision! Older PostGive thanks to Him! Help Make a Difference & Donate Today! If you choose to use Venmo for your donation, there is NO FEE. Our username is @SeeHim-Ministries. Click on the Donate With Venmo button below to continue. You must sign up with Venmo but this is easy and there is NO CHARGE. Thank You! The fee for PayPal usage is 2.5% so with larger donations, this can be a significant amount NOT going to EEWSHM. However, you may use PayPal if you don't use online banking, don't want to mail us a check or if you prefer to use a credit card. Thanks for your support! click here to Donate every time you use Amazon Smile! Set up recurring donations by using your online banking payment option which will allow monthly donations free of charge. Stock donation options are available. Contact us for more information. site by nick hughes design co.